Can you save the world? 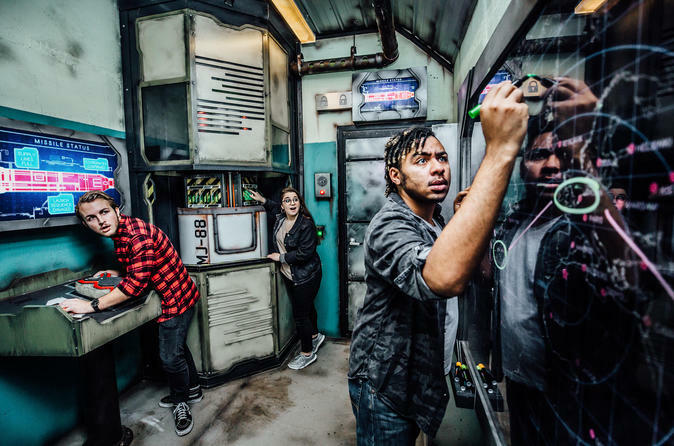 Located in River North just two blocks away from Michigan Ave, The Escape Game offers an escape from ordinary life and allows you to live the stories you love. Here’s how it works: You and your team are locked in a room and have one hour to complete a mission and escape. Escaping will require teamwork, quick thinking, determination and a sense of urgency! In Special Ops, you and your team of agents' routine check of a local market quickly turns into a matter of world security. Can you rise to the occasion and save the day? Located at 42 E. Ontario St., please check in 15-minutes prior to your game start time. Our Special Ops Escape Room is an exciting, immersive game that puts the world on your shoulders. As the closest team of agents in the area, your group has been asked to investigate the Ansar market. The market is closed for the evening and is not known to be a criminal hotspot. However, your “routine check” ends up taking a quick turn and suddenly, the fate of the world rests on your shoulders. With no time to send backup, can you rise to the occasion and save the day?